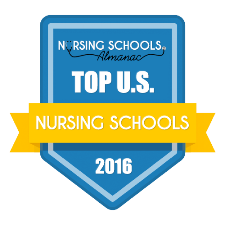 AMHERST, N.Y. – The Daemen College Nursing Department has been named one of the top nursing schools in the country in new rankings released by NursingSchoolsAlmanac.com, a comprehensive educational resource for aspiring nurses. Daemen is ranked among the top 50 nursing schools in the Mid-Atlantic region, placing it in the top 10 percent of all institutions considered for the national list. For the inaugural list, more than 3,200 institutions nationwide were evaluated based on academic prestige and perceived value, depth and breadth of the nursing programs offered, and student success, particularly on the National Council for Licensure Exam (NCLEX). “At a time when there is an increasing demand for nurses, this list carries added importance and underscores that we provide an exceptional educational experience that trains knowledgeable, highly skilled nursing professionals for a variety of health care settings,” said Dr. Cheryl Nosek, chair of the Daemen Nursing Department.